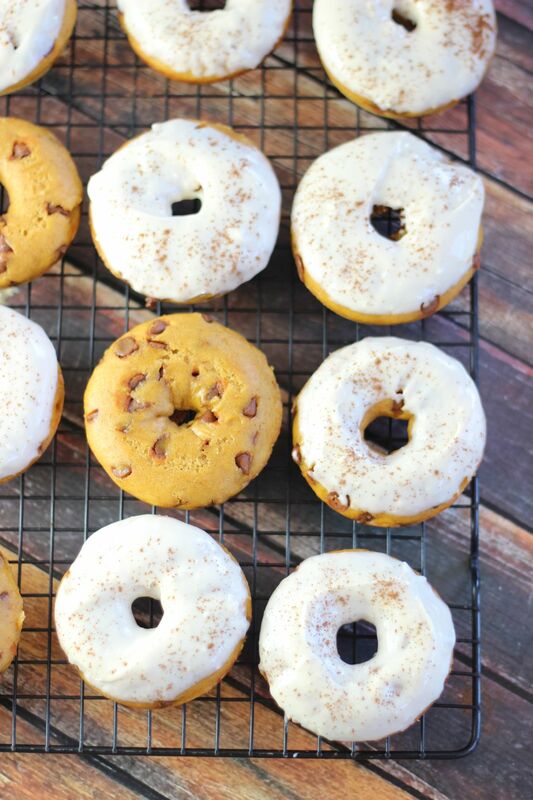 Simple baked pumpkin donuts with cinnamon chips, and a delicious maple cream cheese glaze! 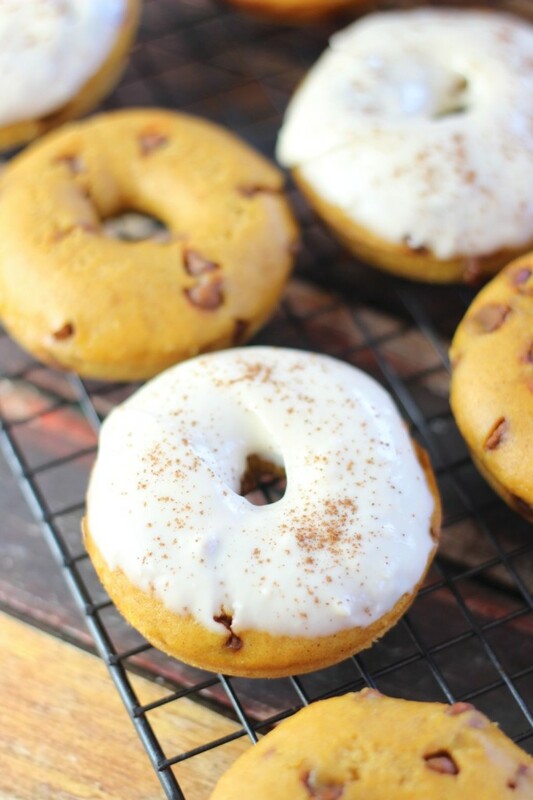 All the cool kids were doing it, so I wanted to make pumpkin donuts too. But also, I have a donut addiction, as well as a pumpkin addiction, so these obviously had to happen. 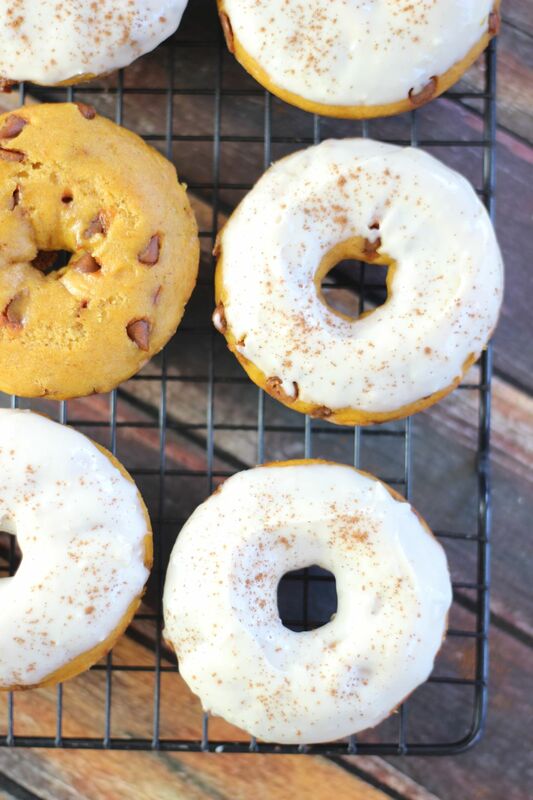 Many of you are also donut junkies, and I KNOOOOOW the rest of the world are pumpkin junkies, so these pumpkin donuts were a no-brainer. These were on my radar to make last year, but I never got to them. I wasn’t letting another fall season come and go without a batch of these donuts. More than a batch. Realistically, a lot of batches. I love that these are baked because 1. it’s easier than frying them. More often than not, I like to take the easy way of making things. We don’t all have unlimited time in a day, right? I wish! These are ready to eat in about 35 minutes. And 2. they are a little bit more healthy. I can eat these donuts, an absolute favorite food of mine, and I can feel slightly less guilty about it. Baked donuts still taste like a donut – truly. These do, at least. 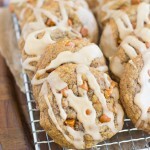 And the cinnamon chips are not a must (I know they can be difficult to track down sometimes), but they certainly add a nice, sweet cinnamony flair! I highly recommend them if you can find them. 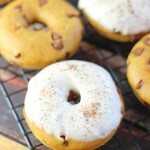 I also think that butterscotch chips are a total delight in these donuts! The glaze… well, it’s sweet, creamy, and perfect. These donuts get a generous dousing of it. 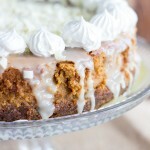 Maple, cream cheese, pumpkin, cinnamon. Those are some heavy hitters right there. 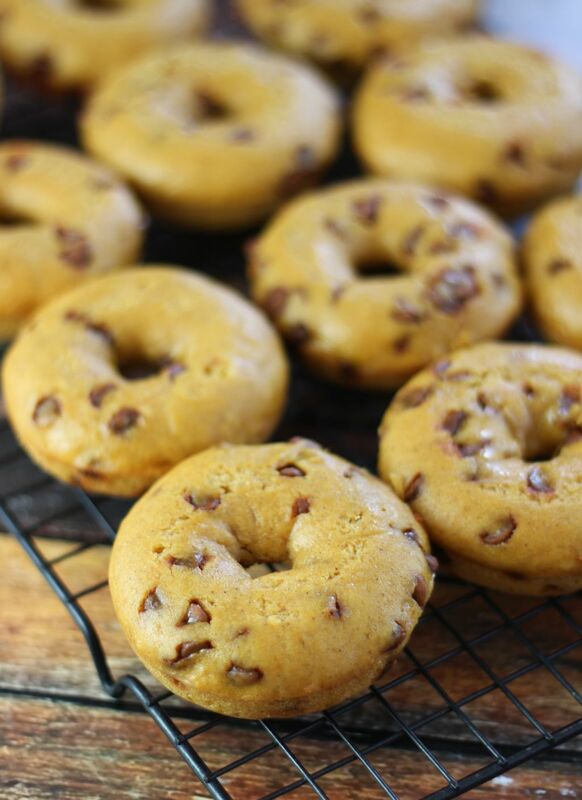 With all of those flavors together in one delicious pastry, these donuts won’t disappoint! 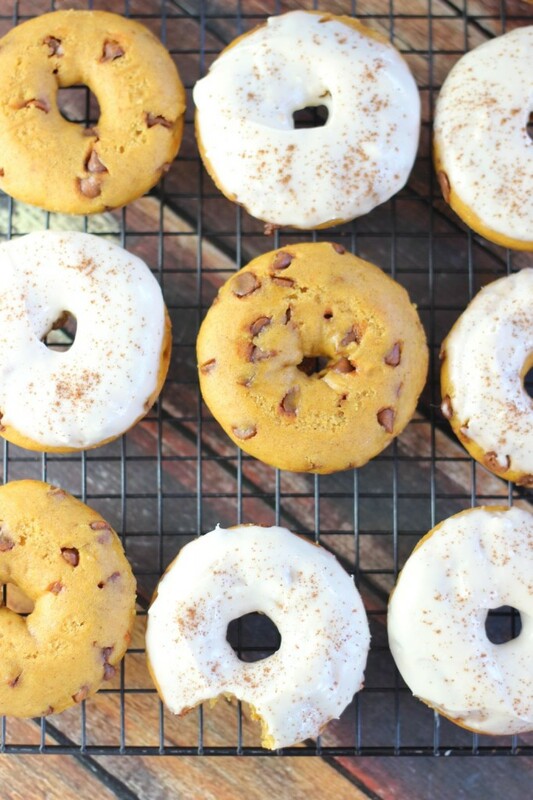 Baked pumpkin donuts with cinnamon chips, and a maple cream cheese glaze! 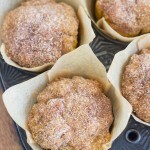 In a large bowl, whisk together flour, sugar, baking powder, pumpkin pie spice, and cinnamon. In another large bowl, whisk together eggs, buttermilk, pumpkin puree, and butter. Fold in the cinnamon chips. Pour batter into a gallon-sized plastic bag, and snip off the corner of the bag. Pipe the batter into the baking pans, filling each donut cup about 3/4 full. Bake at 350 degrees for 15-18 minutes, or until a toothpick comes out clean. Allow to cool for 5 minutes, then flip the pans over and tap the donuts out onto a wire rack. In a small mixing bowl, combine cream cheese, maple syrup, and powdered sugar. Beat until smooth, adding milk as needed to achieve desired consistency. The glaze shouldn't be too thin that it will run off the donut, but not too thick that the donut can't be dunked. To glaze the donut, dunk it into the bowl, and allow the excess to drip off. Allow the glaze to set for 3-5 minutes, and enjoy! Hello Sarah! 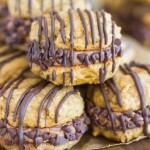 Scrumptious recipe for fall! Thanks so much for sharing. 😛 Pinning! So glad you like the recipe, Vashti! You’ve convinced us . . . we need to buy a donut pan! Would you recommend a silicone or a metal pan? Any brand you really like? Haha, I know, right? 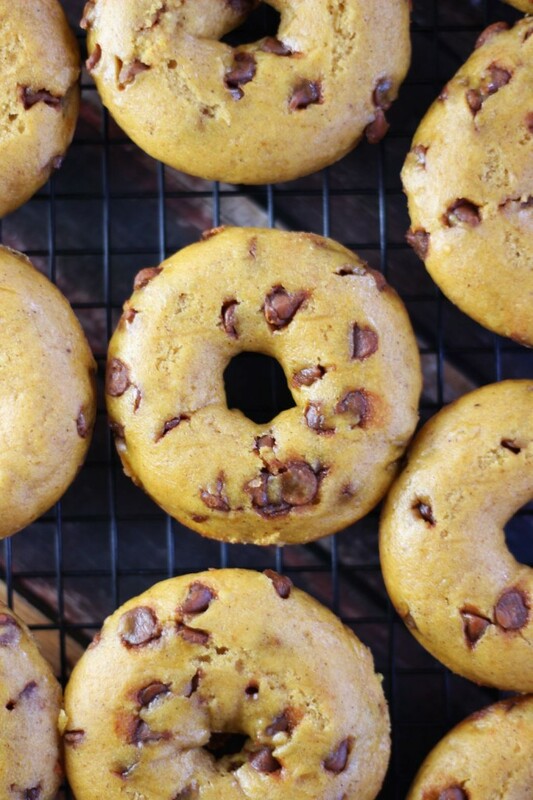 Donuts are so addictive anyway, but these are great with the pumpkin and cinnamon chips and glaze!!! Yum, these look like my kind of donut! The maple cream cheese glaze make my mouth water! I need to make this! Thank you for sharing with us at #ThrowbackThursday we hope to see you again this week! Made these yesterday…oh my goodness. They are delicious. 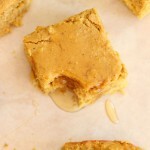 The maple cream cheese glaze ROCKS!!! My family loved these. This is a definite make again and again!! That’s awesome! I’m so glad you liked them! Thank you so much for letting me know that you tried them, and that they turned out well for you! If you have other feedback or helpful notes for others who try them, let me know. Thanks for your comment, Sherry!